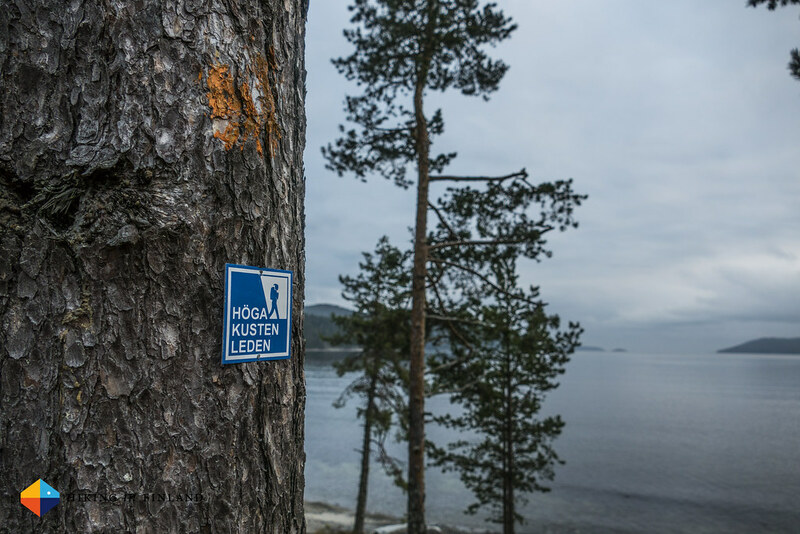 The Högakustenleden - or High Coast Trail in English - is a new trail that passes through the UNESCO World Heritage site of the same name. 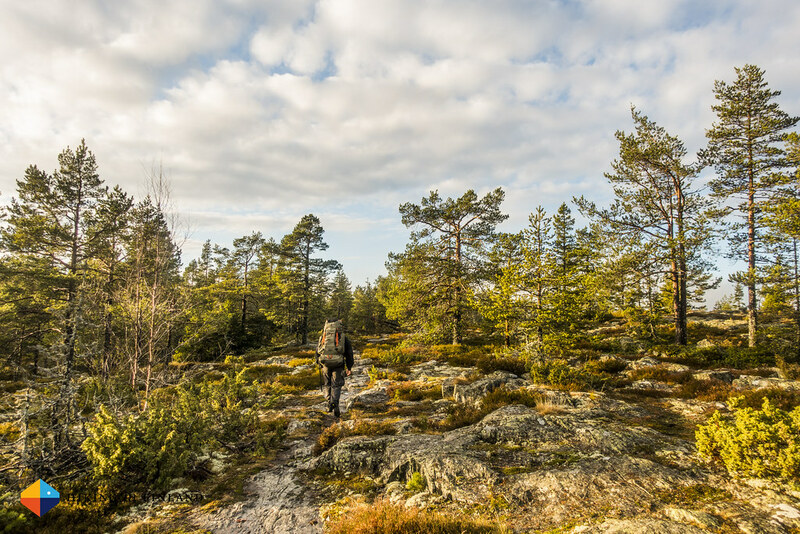 The scenic trail passes through villages & towns, along the coast, through the forest and a beautiful National Park and if you have a free week makes for a great walk along the Swedish coastal hills. November marks usually the last month of the year where I go out on a Press Trip to do research for magazine articles. 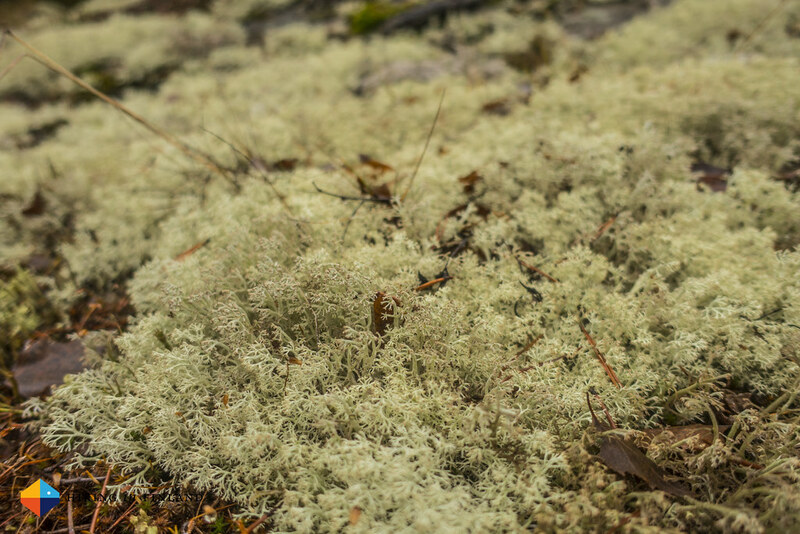 It’s far from the perfect backpacking month in the North and I had planned to hike the High Coast Trail in August, but changes in schedules meant it’d be the final backpacking trip of the year. Happily my good friend Martin agreed to accompany me, and so we met up late on a Sunday night in a Hostel in Umeå, him after flying in, me after taking the ferry from Vaasa. 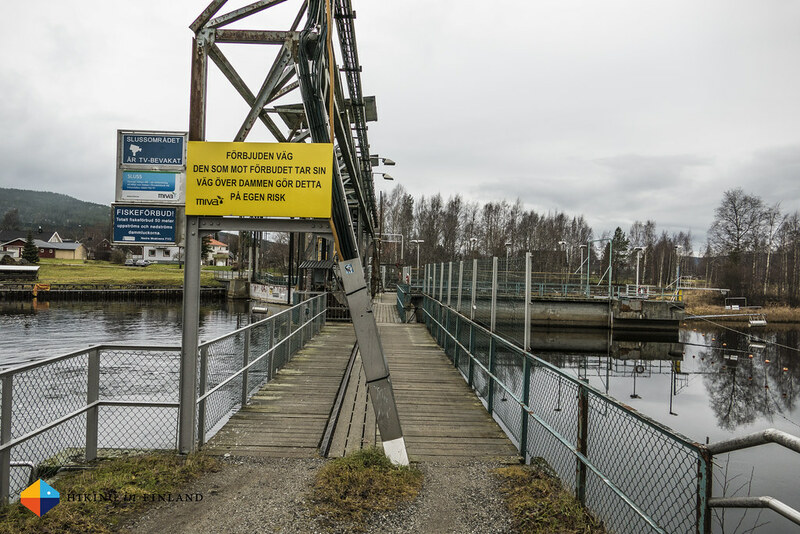 The next morning we enjoyed the breakfast at the Hostel and walked to the bus station from where we had a comfortable and fast bus ride to the bus stop at Hornöberget just before the High Coast Bridge, the start point of the trail. 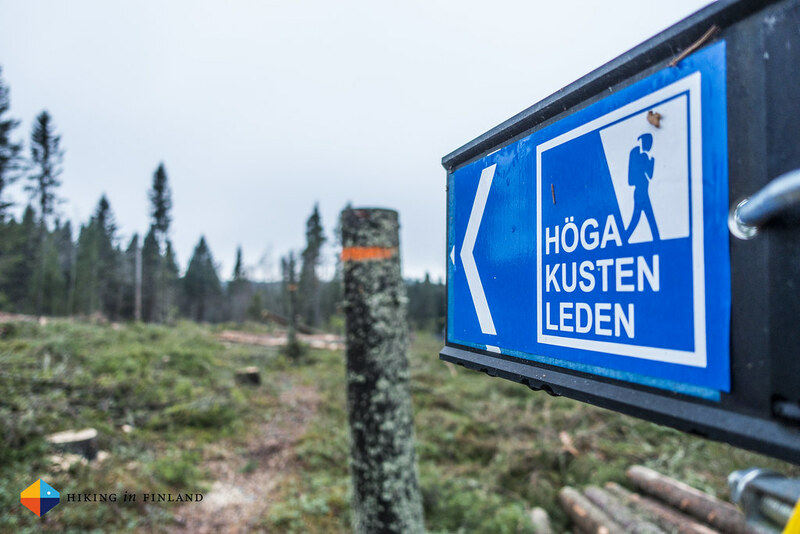 We followed the street for a bit, took to a forest road and soon saw our first Högakustenleden trail marker and were on a proper trail. 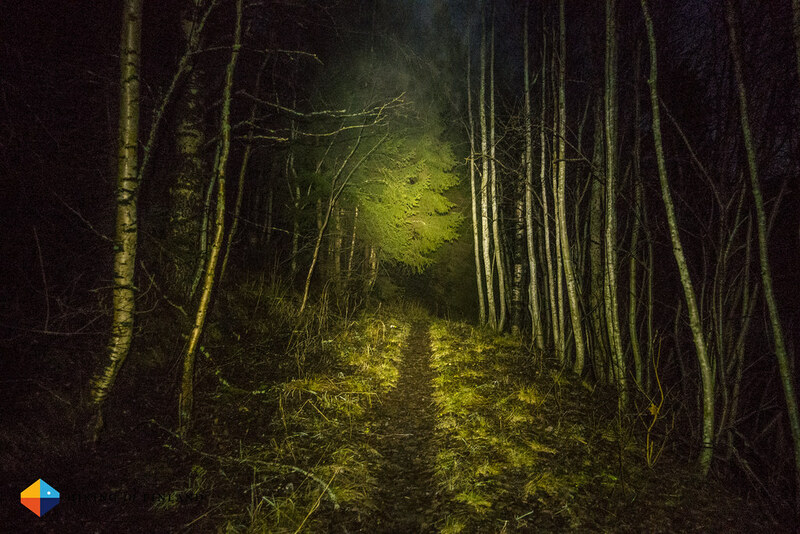 It was a short one, though, because the next several kilometres took us along on village roads, along the street, across bridges until we finally walked along the Baltic Sea and came upon a proper trail into the forest. 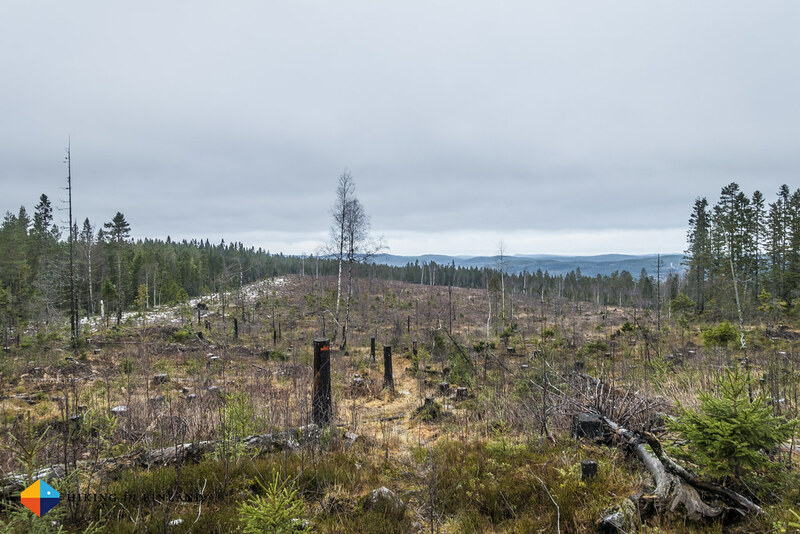 It wasn’t all pleasurable forest trails, though, we also passed a few deforested areas until we finally reached Sör-Lövvik, the end of section 1. 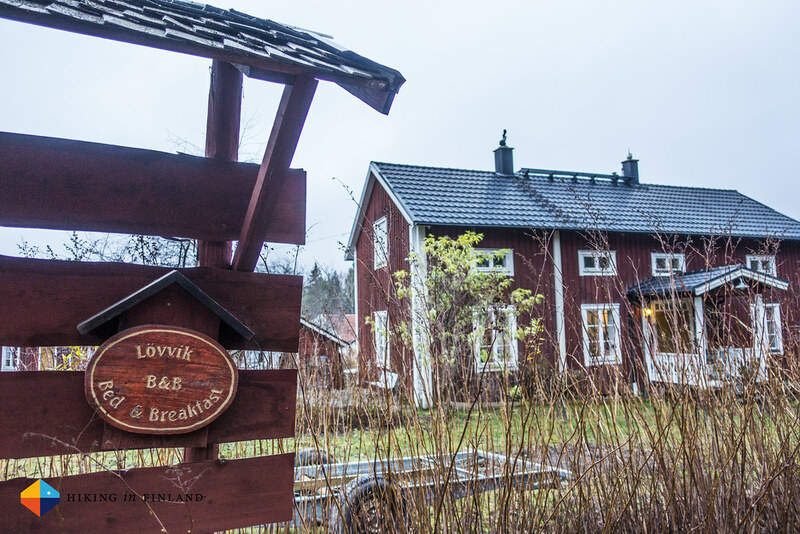 The Lövvik B&B looked inviting just along the trail, and while it was still early in the day we somehow wouldn’t have minded to stop there or at the free cottage in the village, but as it was closed for the winter we just continued until Fjärdbotten. We hiked for a while along the road and then took a turn onto a forest path. We found a stream to refill our water bottles and continued until the Laavu at Halsviken Bay. The place looked nice, and with dusk upon us we yet again were tempted to put the HMG UltaMid up for the night. 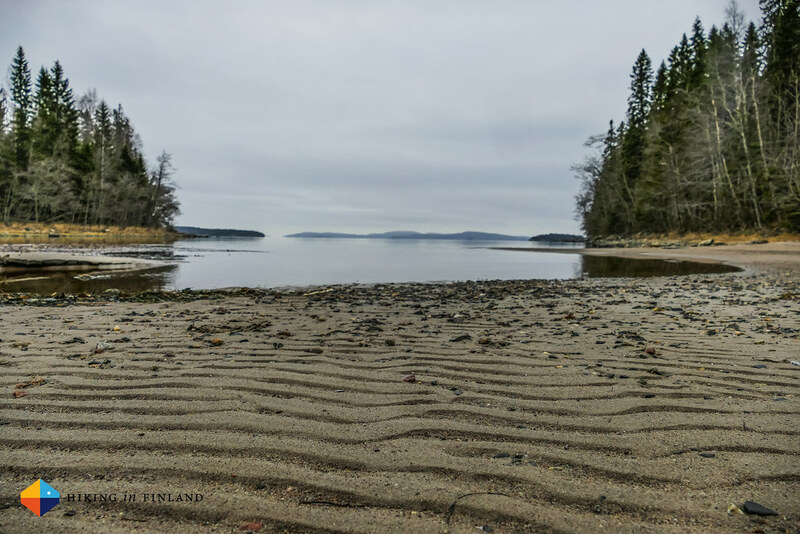 We resisted the early finish and continued on the trail, which then went through a boulder field along the shore. 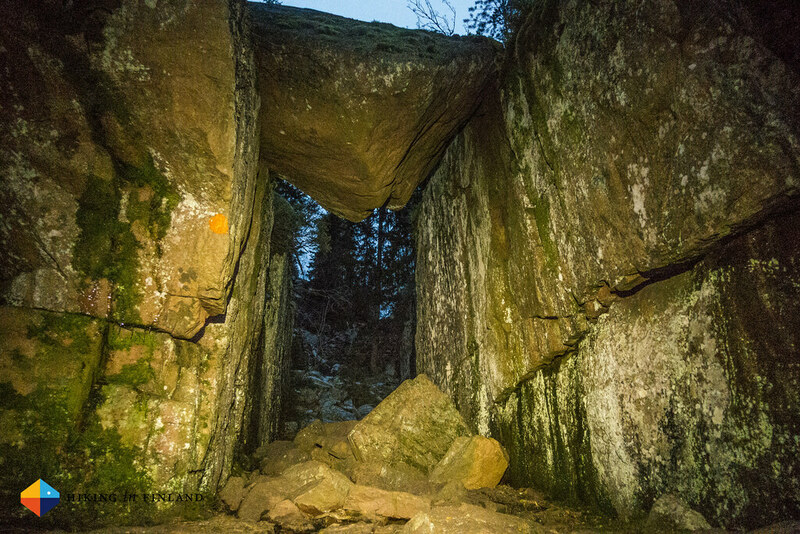 Sleet from the sky, strong winds and spray from the sea make walking on boulders a pleasurable past time, which only can be improved by onsetting darkness. We somehow managed to no break any feet or legs and were rather happy as we reached the forest road and road to Fjärdbotten. It was dark and raining as we arrived there, not knowing what to expect. Fjärdbotten was a great camping place. 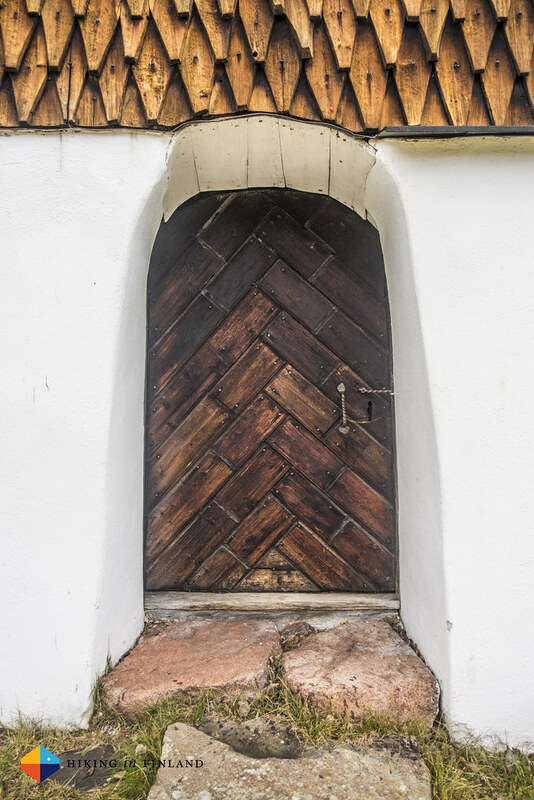 Around six wooden cottages with tables, benches, beds and some with a stove in them were too good a chance to pass up. 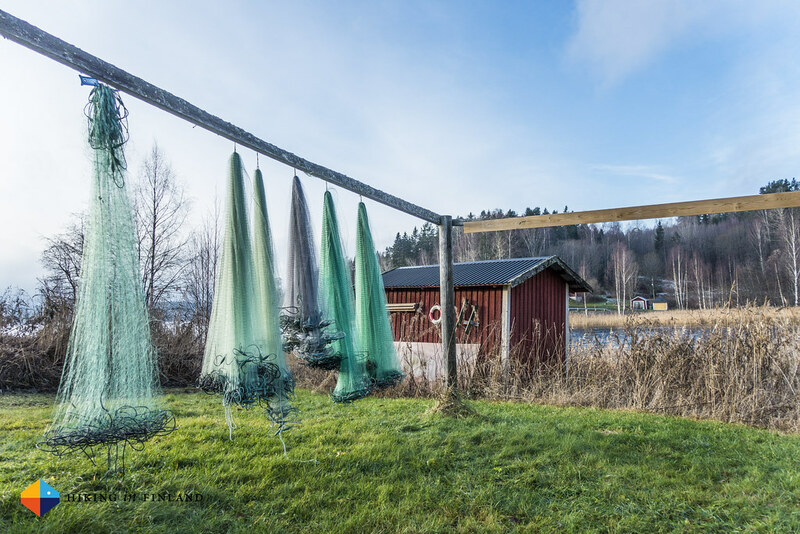 Martin quickly put a clothes line up, we hang our wet gear up to dry, got a fire started and then the Primus Lite+ came out and boiled us hot water for dinners and Minttu Kakaos! Well fed we soon dived into our sleeping bags and had a good night’s sleep. The next morning was drizzly but looked like it might clear up. 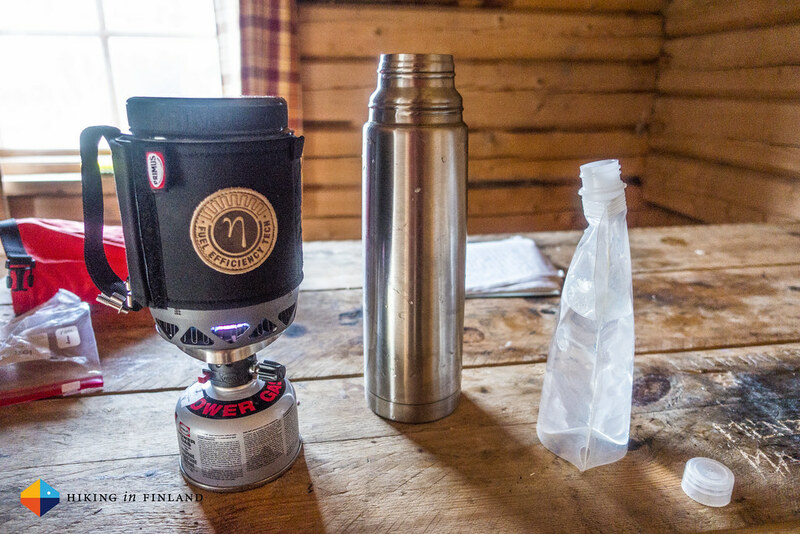 After we explored the Fjärdbotten summer farm and checked out the other cottages and got water from the well we had a warm breakfast & coffee, boiled water for our Thermos and then soon were out on the trail again. 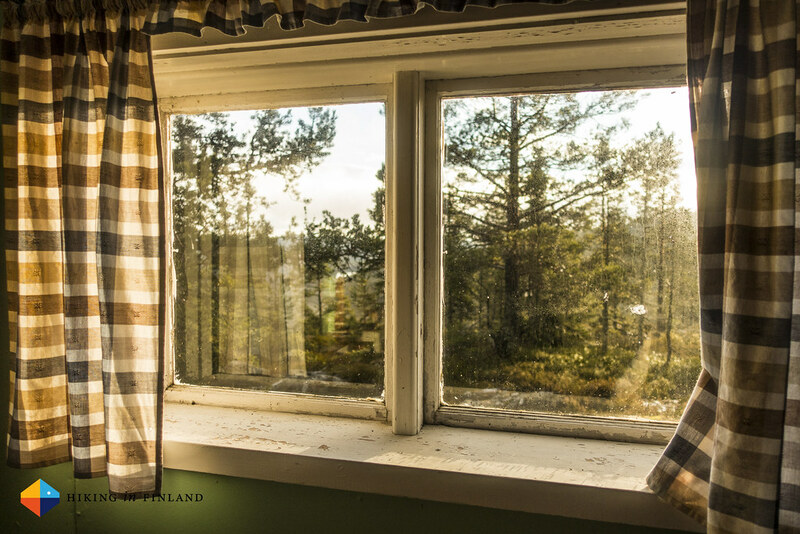 The decision to stay at Fjärdbotten was a good one, and it was a very nice place. The next section took us on the highest point along the trail, Jon Nils Berget. 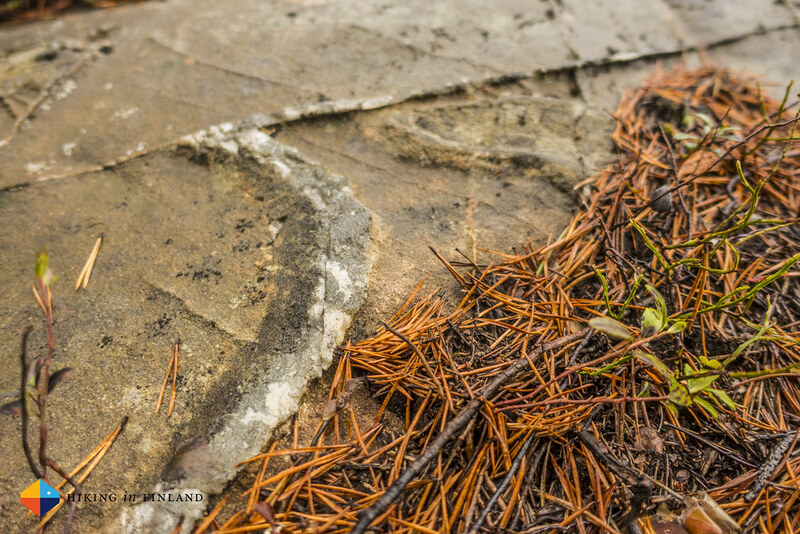 We were lucky as the drizzle from the morning stopped after a few kilometres of hiking and we were treated by one of those fine, sunny days which you get after a night of rain. The trail was a mix of nice forest roads (they’re great to walk and talk on with a party of two!) 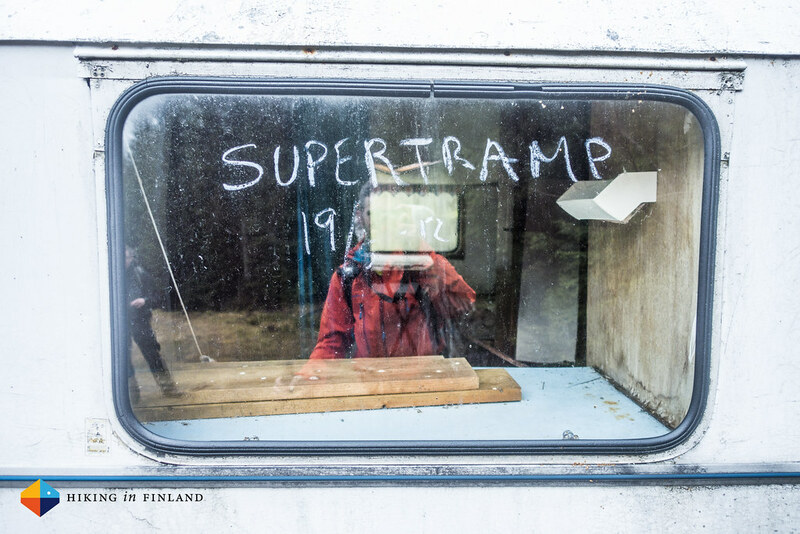 where abandoned caravans were every few kilometres. As we reached Jon Nils Berget the sun came out and we really enjoyed this beautiful moment. 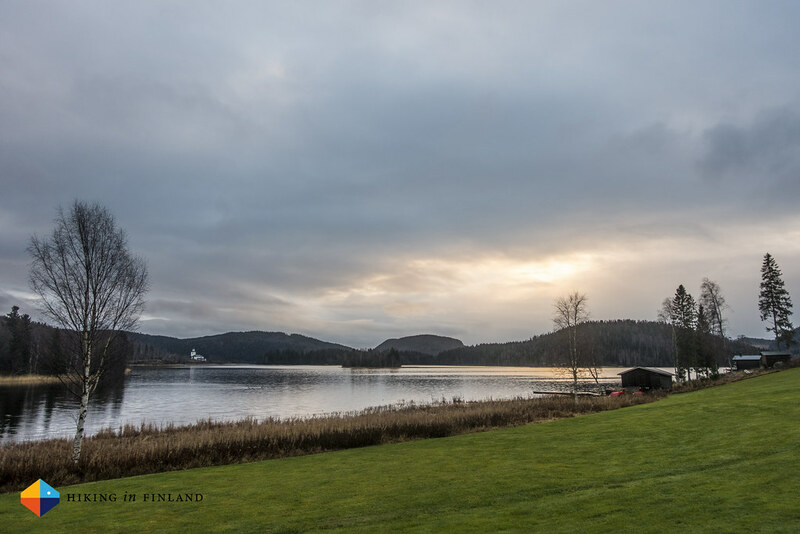 We had a quick tea and cookies break at the Nipstugan on Lidenipan, and the sun just continued to treat us with warmth and light on the way to Gavik, the end of the 3rd Section. Behind Gavik we hiked on a forest road along summer cottages which had been closed up for winter, and had a very late lunch as the sun was just setting somewhere in the West. 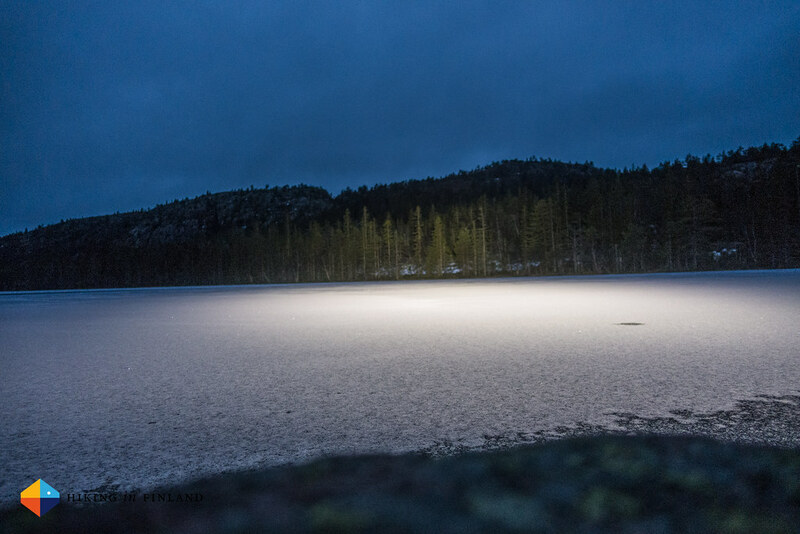 Soon the headlamps came on as we hiked on dark and wet forest trails and snowy forest roads. 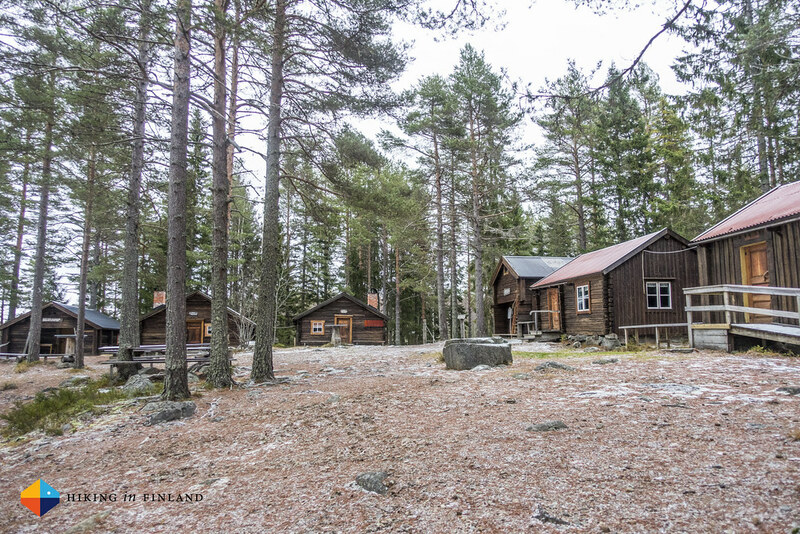 The goal of Section 4 was Lappuden, which was hailed as the camping spot along the Högakustenleden. Well, it was not. As it was closed. Closed up for winter. 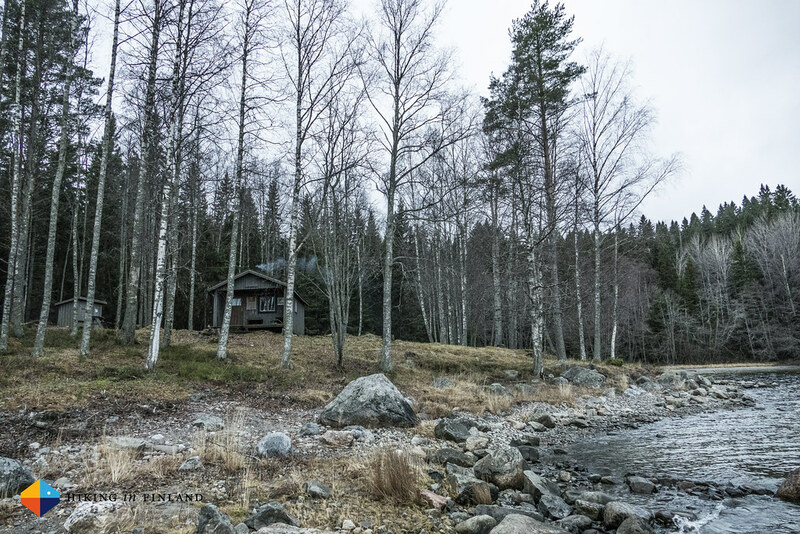 After the luxury of the Fjärdbotten hut we were going to sleep outside, and as the lake and grass fields already were covered with thin ice we knew we’d be in for a cold night. Alas, not even a fire we were able to lighten up, for a lack of wood and a fire place. We still had a good night, even if my PHD Minix Sleeping Bag was a tad too less insulation for these temperatures. 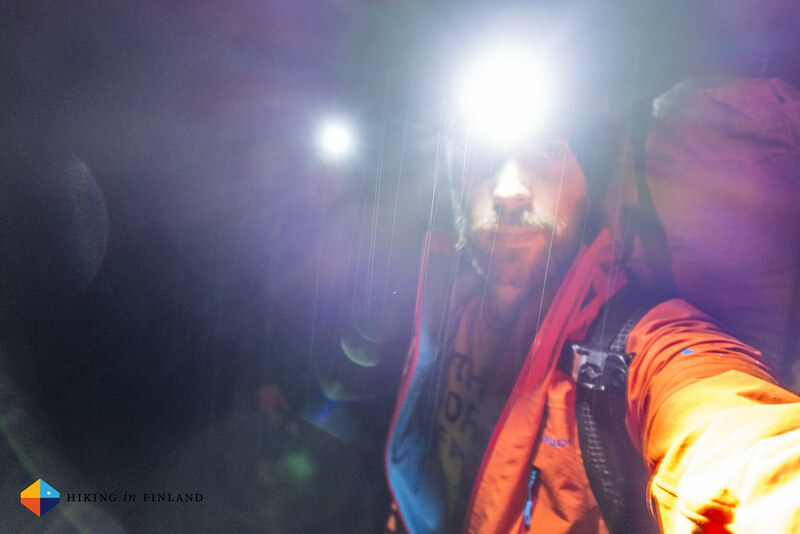 The next morning the fēnix said -3°C and we packed up while the Lite+ boiled water for breakfast & coffee. 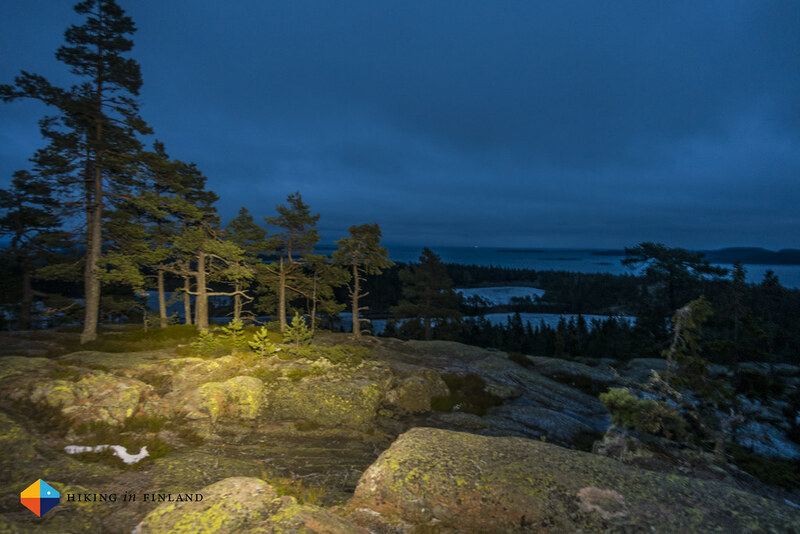 We were early on the trail again, and we were happy to leave the disappointment of Lappuden behind. The trail was again a mix of enjoyable forest trails, OK forest roads and less enjoyable asphalt streets, but happily the trails made up the majority os Section 5 to Ullånger. 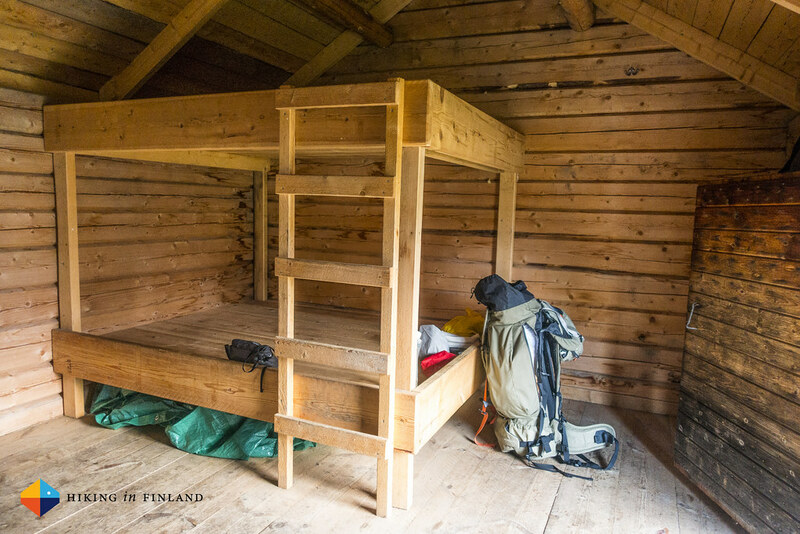 The highlight for Martin and me was the beautiful Erikskojan hut high up in the middle of the forest. It stood lonely there, and if I hadn’t pulled like someone who really wants to sit inside with his tea we probably would have drunk our hot tea on its steps as the door was very tightly closed =) Of all the huts we passed this was the one we both really would have loved to stay in for the night, as it was cozy and comfortable. Alas, we needed to continue onwards. As we hiked into Ullånger it was still lunch time, and we didn’t need long to decide on the Värdshuset Restaurang Snäckan to get our business. 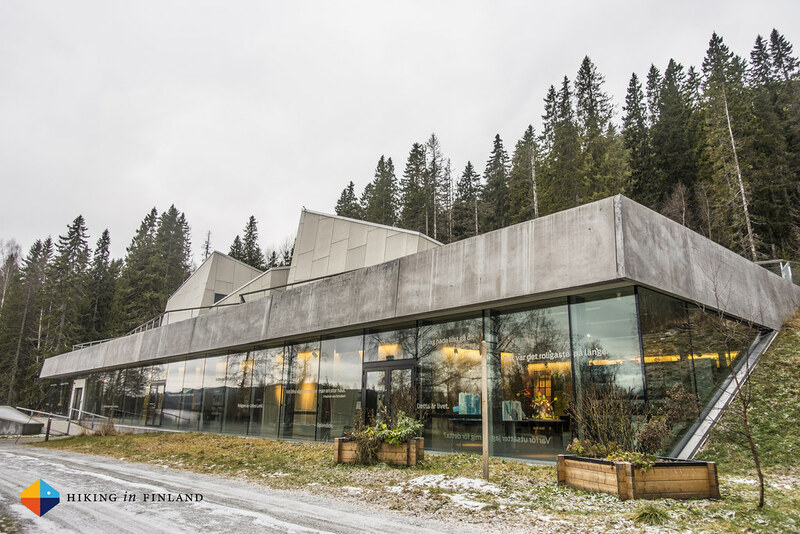 A Lunch Buffet is a Hiker’s dream, and tasty Swedish food was consumed in large amounts, topped off with coffee and cookies. 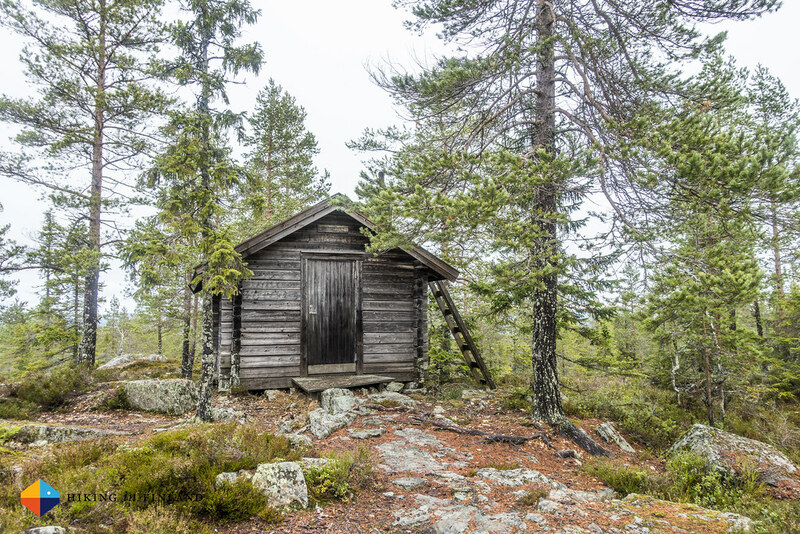 It was fortunate that we didn’t need to hike a long distance to our next camping place, the Gårdberget Stugan just above Ullånger. We didn’t really know what to expect, but were delighted by the hut, which was decorated in a 70s style and had a big stove inside. A fire was roaring quickly while night fell, and we enjoyed the evening by talking and drinking a good Whisky. The night over a powdery coat of snow covered the land and we enjoyed the walk in the morning through the silent forest. 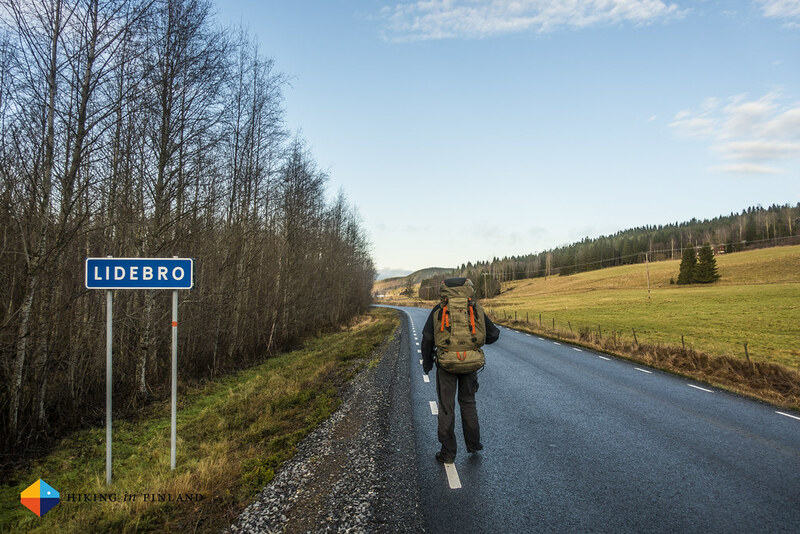 That silence was interrupted the closer we got to Sjöland and Skoved as the trail went along the highway. 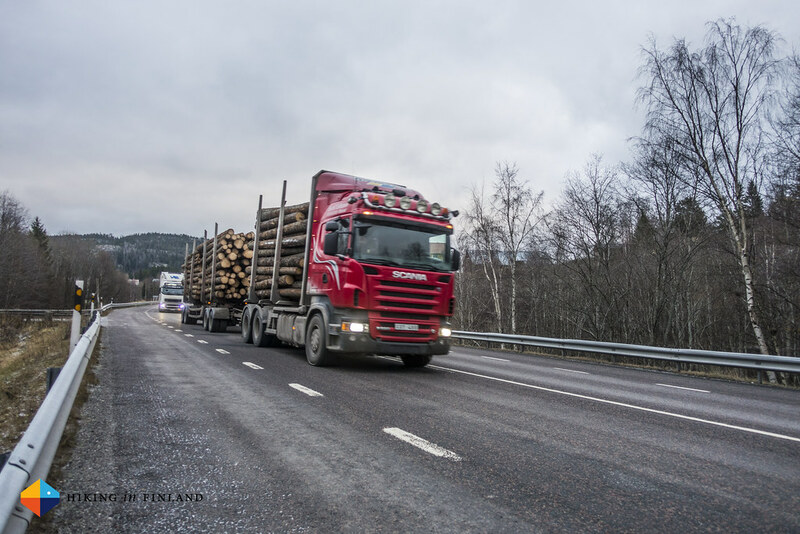 It was an interesting experience to hike with trucks and cars passing by at high speeds, and I do hope that the trail finds a different route in the future. 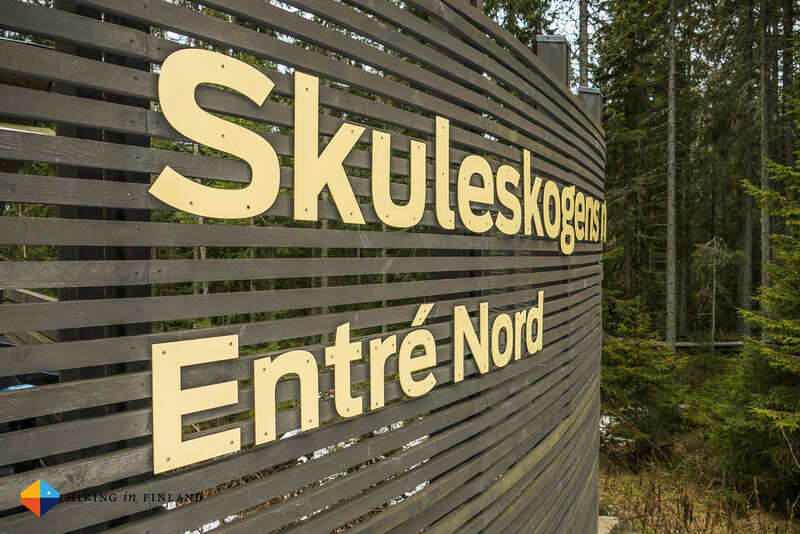 We flew through Section 7 from Skoved to Skuleberget and the Naturum Höga Kusten Centre. Sadly the Museum also was closed, and as we still had well over 15 km before us we also didn’t take the detour over the top of the Skuleberget. The hill was impressive, though, and it’s nice to see that local entrepreneurs have installed Via Ferratas on it. Section 8 from Skuleberget to the Skuleberget National Park South Entry must have been one of the most frustrating ones on the trail. 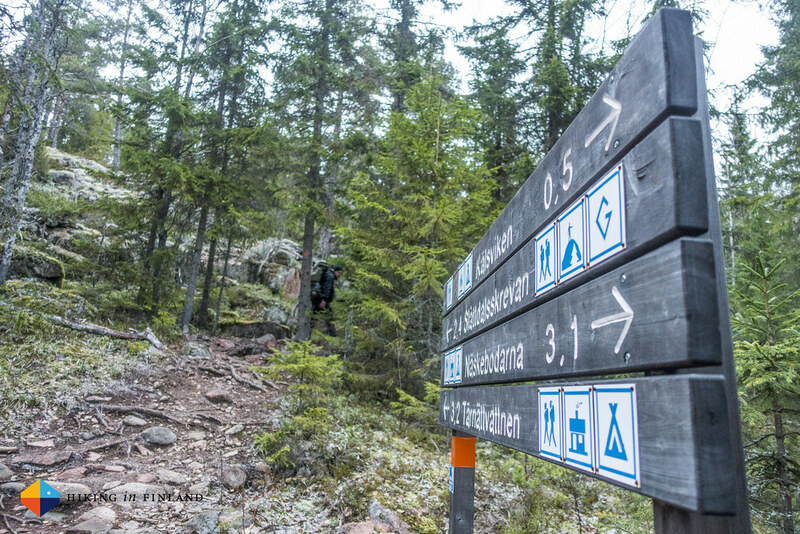 After the Naturum Höga Kusten Centre we had another quick lunch break outside and then followed the nice Kids Adventure/ Robber Trail, passed an Open Air Theatre and then crossed the highway once more to hike on trails and forest roads to the South Entry of the National Park. Some sections of the trail were flooded and it was impossible to keep your feet dry, which usually doesn’t bother me at all, but somehow that day it really annoyed me a lot. The trail wasn’t fun in the wet dirt & mud, but happily I recovered as soon as the trail became dry again. 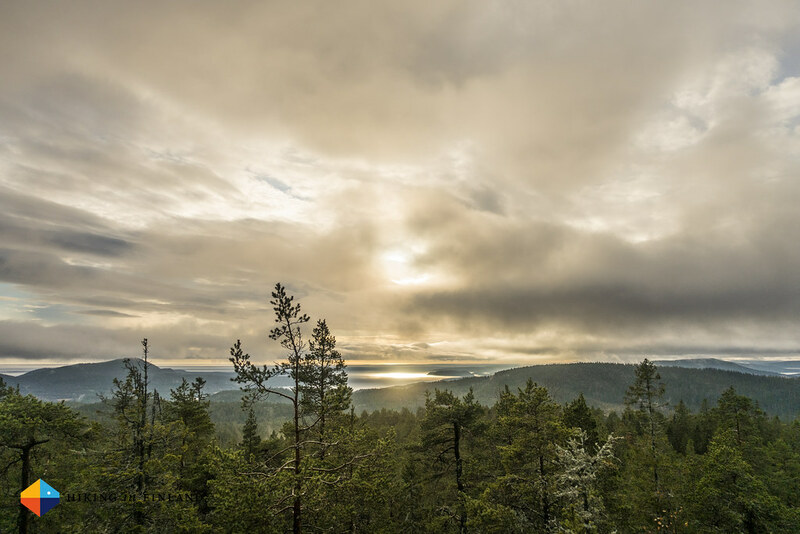 As we came closer and closer to the Skuleberget National Park the better our moods got, and the view from the South Entry was indeed well worth coming there. 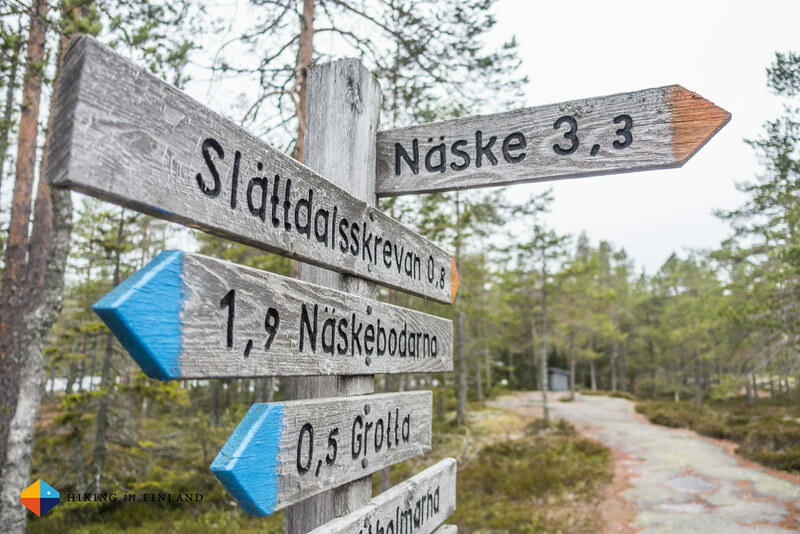 As frustrating as that wet part of the trail previously was, so wonderful was the Skuleskogen National Park. The National Park probably was the highlight of our trip, and we were a bit sad that we spend only such a short time in day light in it. 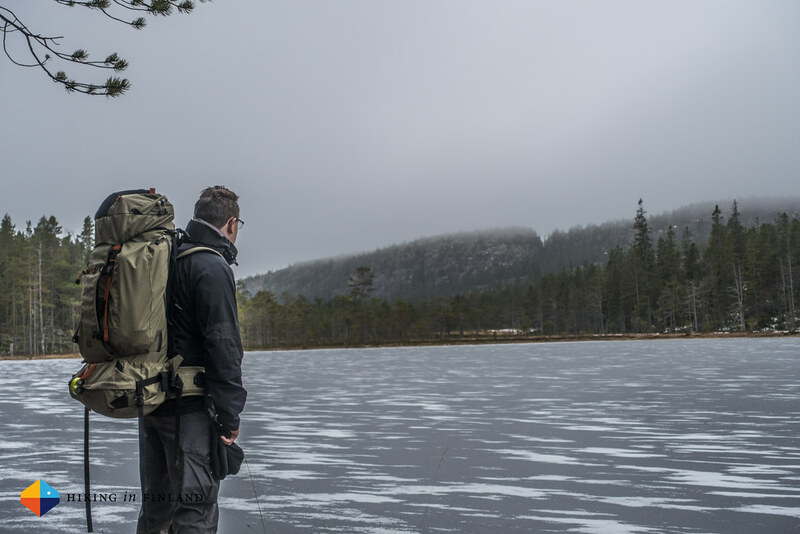 We hiked on duck boards for kilometres, passed waterfalls and then hiked up to the impressive Slåttdalsskrevan, a 200 m long, 40 m deep and 7 m wide crevice. 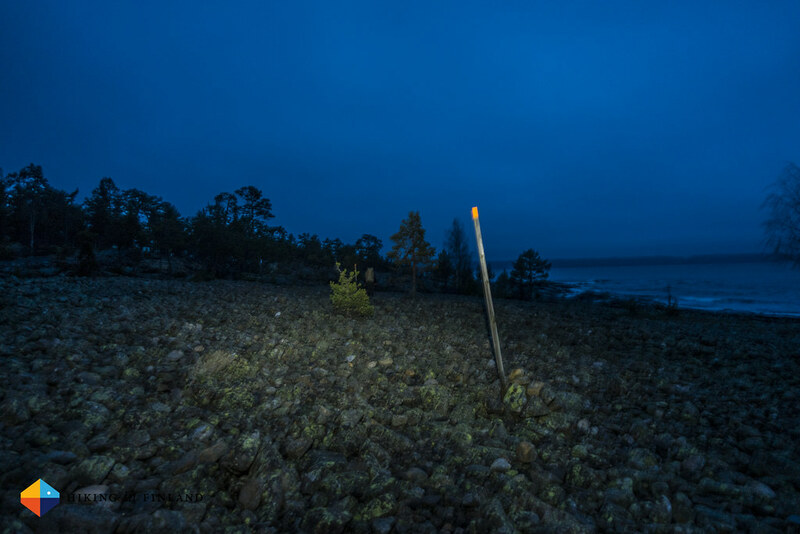 We explored it in the shine of our headlamps and then made us on the way down to the Tärnättvattnen Stuga in the middle of the National Park. 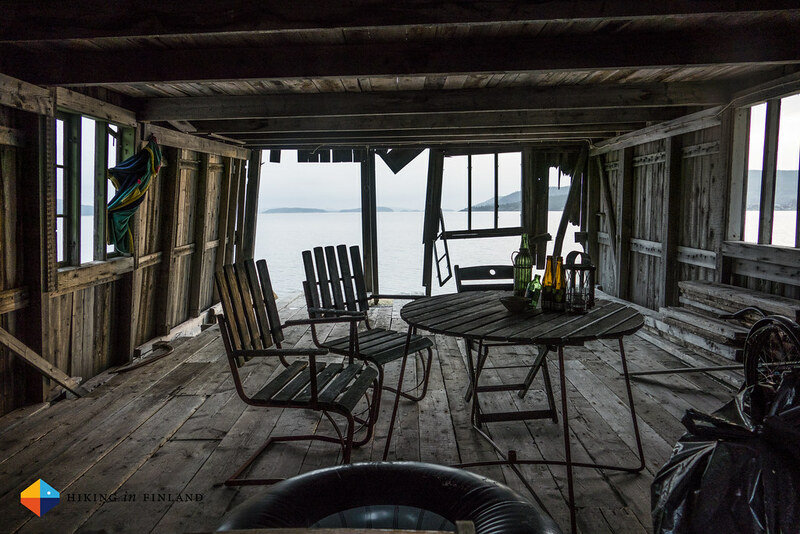 The hut was gorgeous from the inside and outside, though as it often happens with such huts, they seem to accumulate rubbish and trinkets which previous visitors left for others to enjoy or simply forgot. 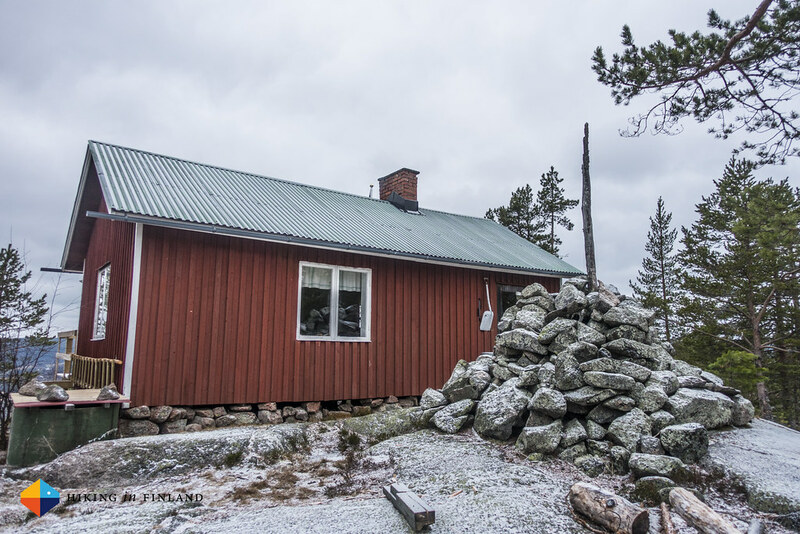 We cleaned up, got a fire started and enjoyed the evening with the a Feierabendbier which we carried all the way from the Supermarket in Docksta till here to enjoy in this rustic hut. The next morning grey clouds still hung thickly in the sky and the sun wasn’t to be seen. We brought some more wood for the next visitors to the hut, cleaned up and packed and where on our way again. 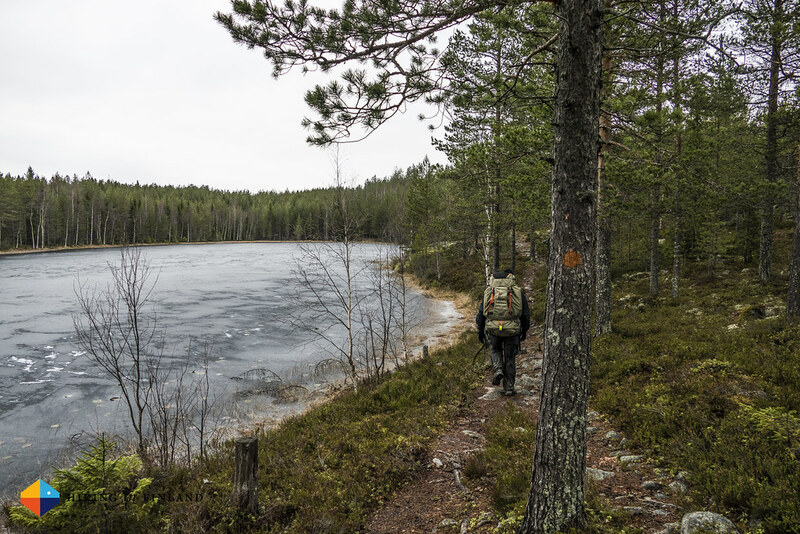 The way out of the National Park was again very beautiful, along frozen lakes, via Duckboards over swamps, over small streams and soft forest trails until the North Entry. 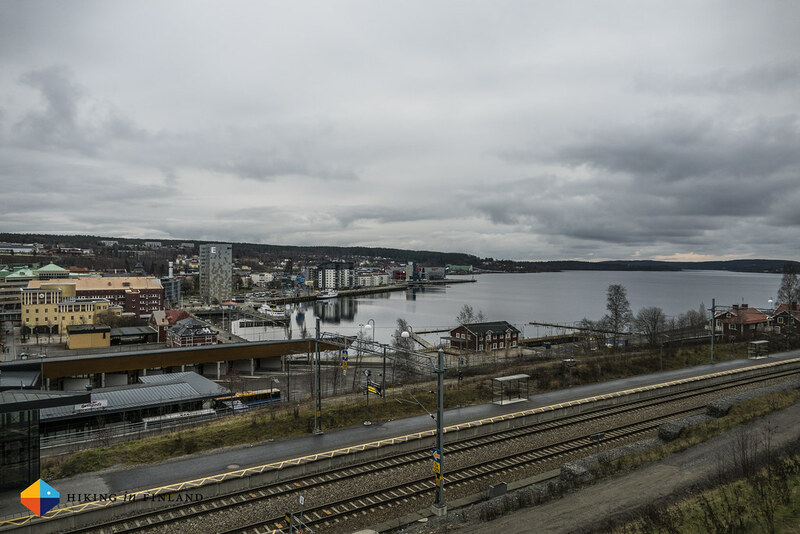 It was noon as we arrived in Köpmanholmen, and as every good tourist hiker does we immediately located the local Pizzeria and ordered their lunch Pizza. 60 SEK for a Pizza, salad, drink and coffee is a real bargain, especially considering that the Pizzas were about 40 cm (!) in diameter. We were stuffed as we walked out of the village and walked on a sandy road until the where we would enter the Balesudden Nature Reserve. 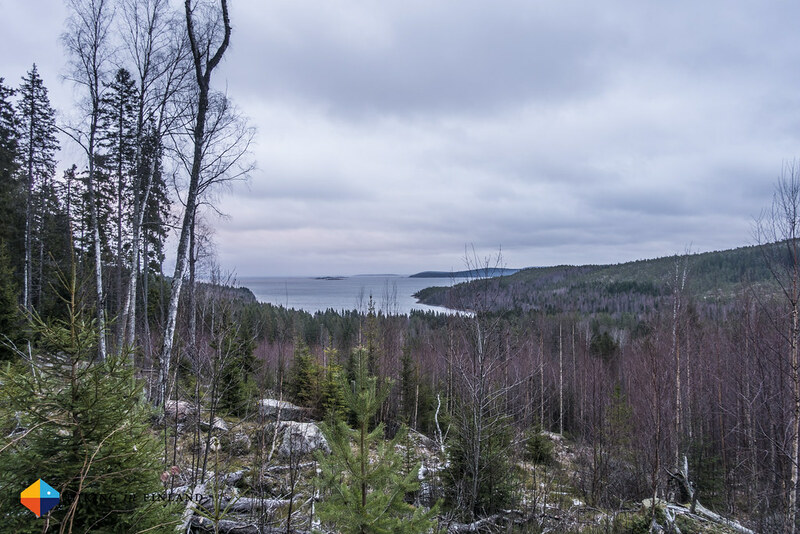 It was a very beautiful reserve and not even a kilometre from the start of the forest trail we passed the prettiest Laavu on the whole Högakustenleden, up on the hill overlooking the Baltic Sea. Again we regretted that we needed to push on and couldn’t stay here, as the view and atmosphere was gorgeous. Instead we pushed on through on and up through the Balesudden Nature Reserve, though with dusk coming upon us and a light drizzle we had our eyes mostly on the slippery trail in front of us. 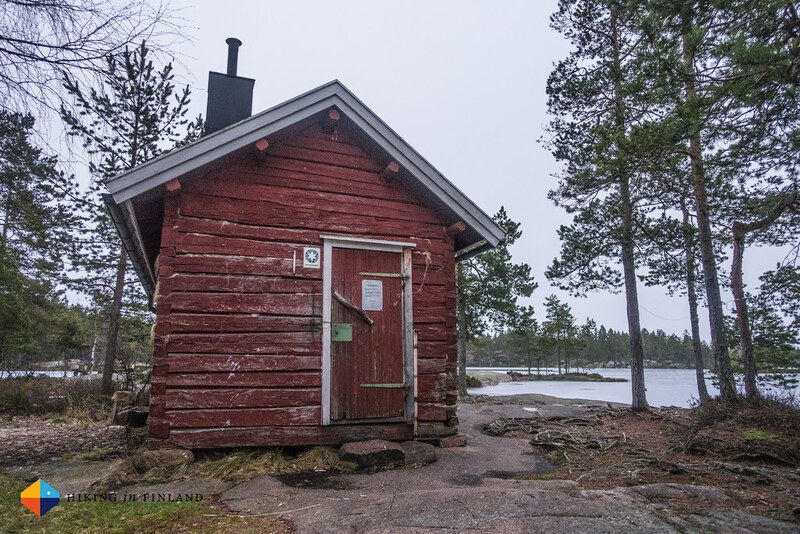 We passed a nice fireplace and camping spot near a bay until we happened upon the Bodviken Stugan, our hut for the night. The drizzle had become rain and I was happy as Martin offered to go chop the wood. I started the fire and rolled out my sleeping bag and mattress and again fired up the Primus Lite+. Soon we were well fed and had a whisky in our cups, which ensured we had another good, relaxed and warm night. 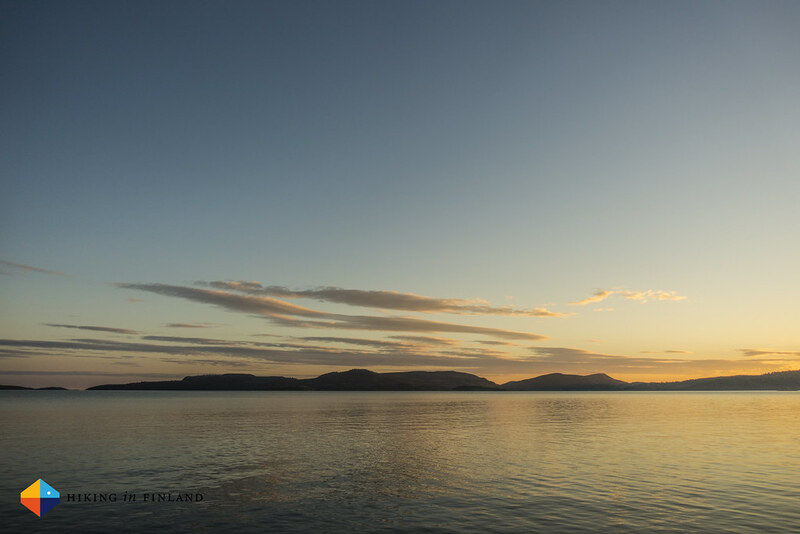 In winter you can sleep long and still catch the sunrise. 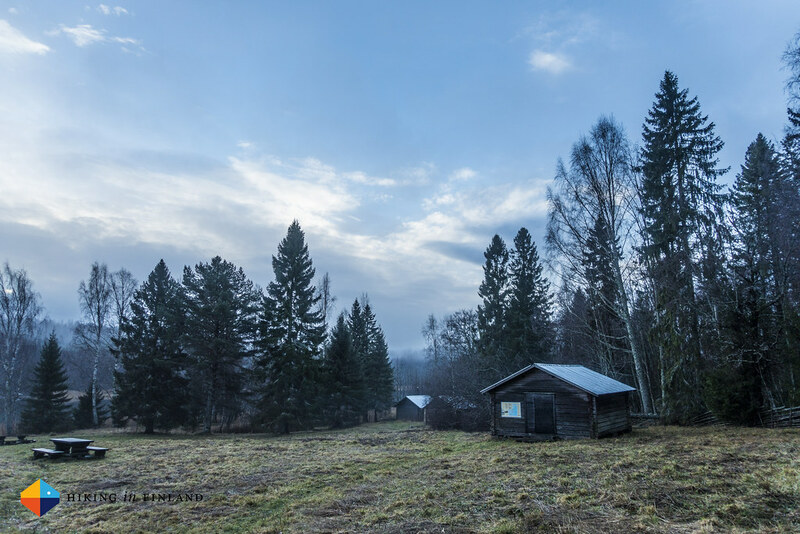 So after we had breakfast I took a little stroll around the hut to photograph the sunrise. 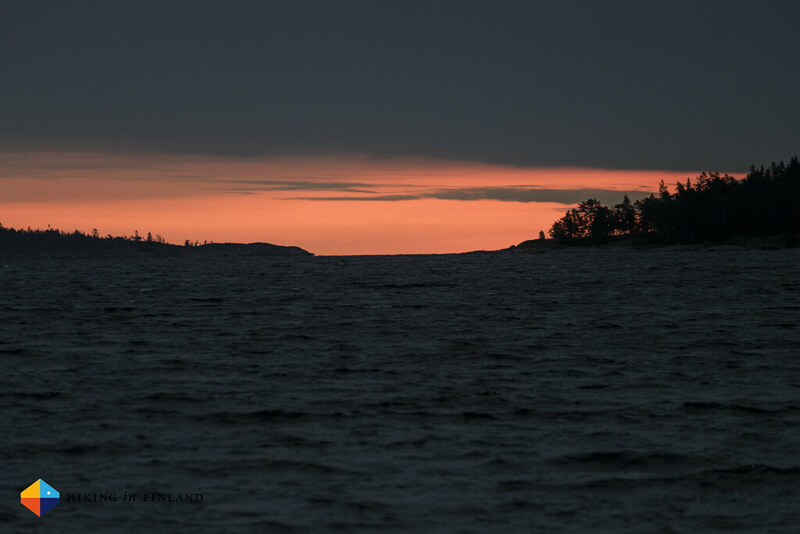 It was just a brief moment where one could spot the sun, as it passed up from the sea to hide again behind the clouds. 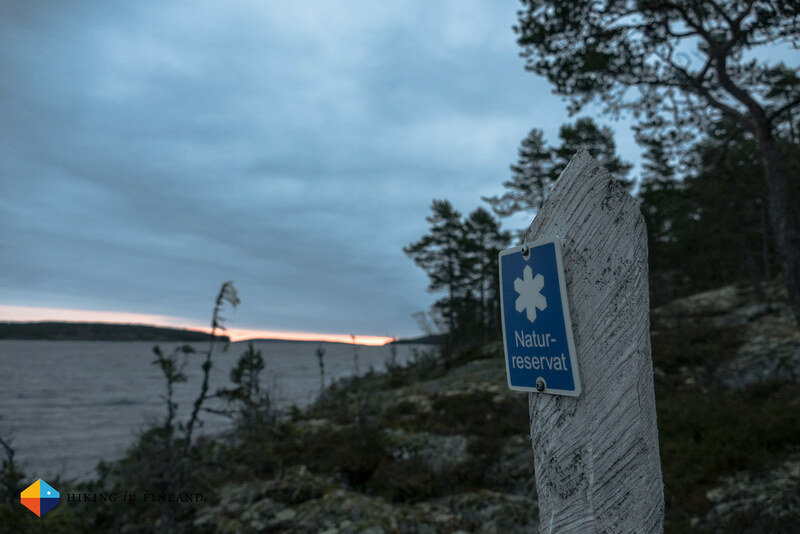 It was our last day on the trail, and we only had 21 km till Örnsköldsvik, with the last part in civilization, so that we took it easy. 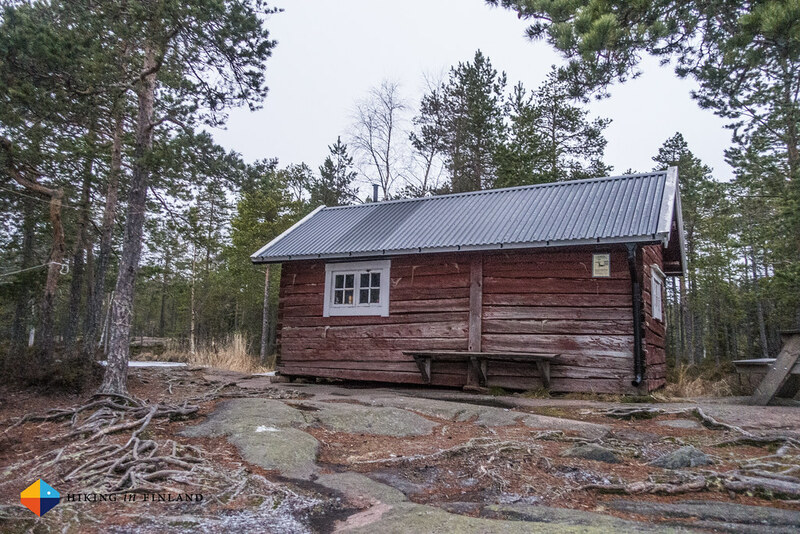 We passed a few more Laavus in the morning, hiked on forest roads and streets, up hills and had a quick break in the Småtjärnstugan, and then were very quickly in Svedje, the end of Section 12. From here we passed through the town and climbed the local recreation area. 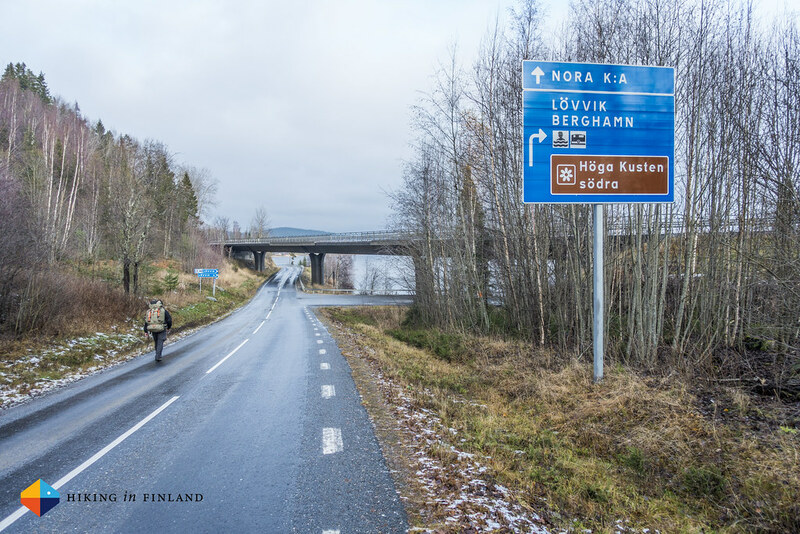 As it was windy, 0°C and grey we just marched on towards Örnsköldsvik, the end of Section 13 of the Högakustenleden. Early in the afternoon we reached town. Done. While standing on the square in the centre a young Swede came talking to us, who recognized me as the writer of Hiking in Finland. It was a fun coincidence as he said he saw that we’d be hiking the trail that week and he met us just as we finished! Very cool! 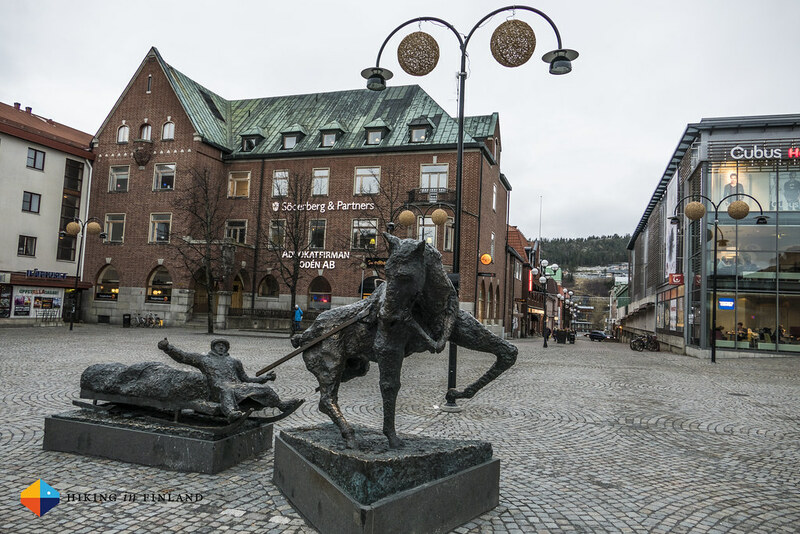 After inquiring about a good place to eat in the evening we walked to our hostel, Vindarnas Hus. It was a nice & quiet hostel with Wifi, hot showers and good beds, and we chilled there in the evening until we headed out to eat at The Bishops Arms which not only had superb food but also impeccable service and great beers. 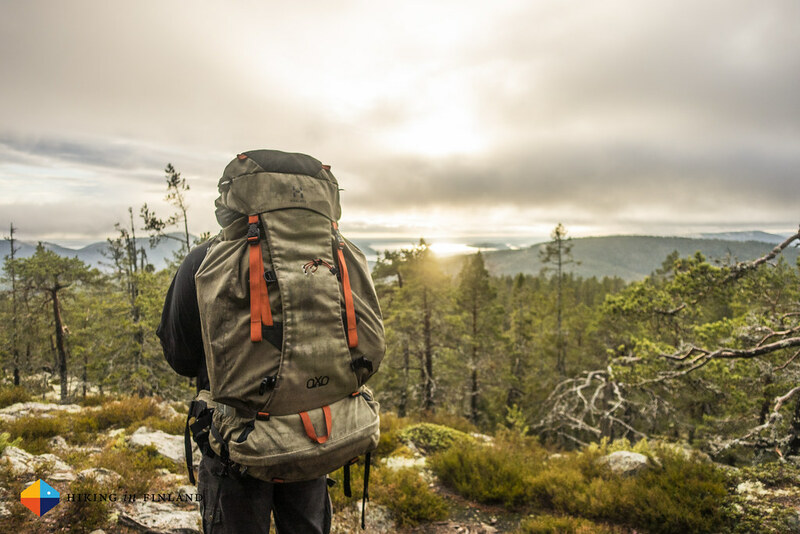 It was a worthy finish to a great Högakustenleden thru-hike! 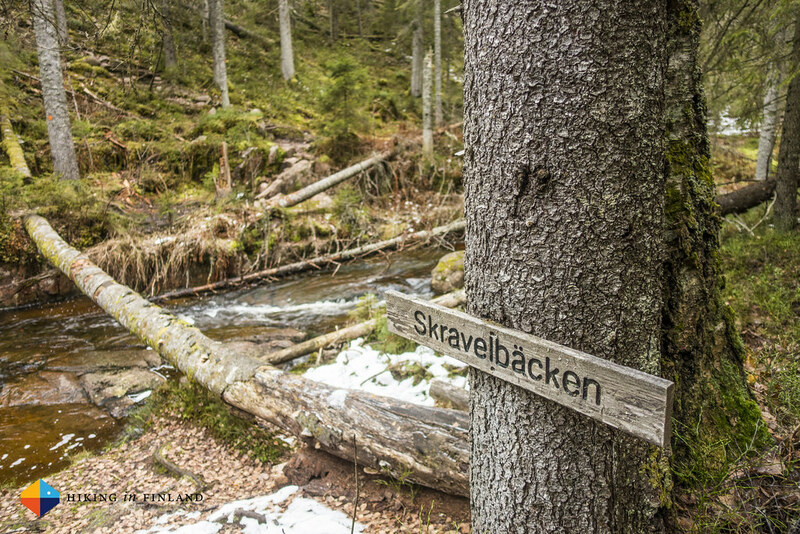 To see about 150 more photos check out the Höga Kusten Trail Album on Flickr. 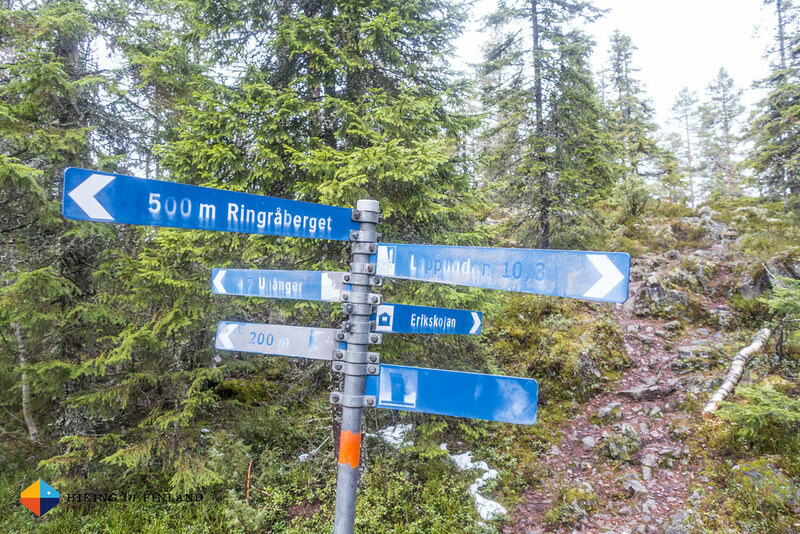 The funniest thing about the Högakustenleden was for Martin and me how the distances were way off from what the signs and the guide booklet said. It makes me wonder if the trail is actually hiked by the people who planned it and if they made the effort to check the distance, or if these were just made via some mapping tool. Because the Högakustenleden is supposed to be 128,6 km from Hornöberget to Örnsköldsvik, but I tracked with my Garmin fēnix 141,8 km in the six days we hiked it. 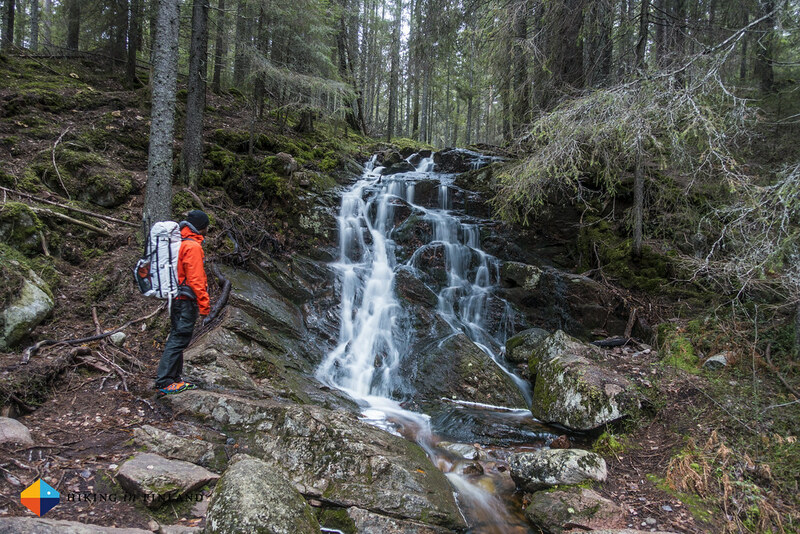 This isn’t uncommon and I regularly hike trails and sections which are longer/ shorter than they’re claimed to be, but still is something to keep in mind when you plan to hike the trail. Also important to know is that the trail goes quite a bit along forest roads and streets. It does feel like at least 50% of the trail makes use of such infrastructure, and while it can make for fast hiking (5 km an hour and easy to chat while walking next to each other) it isn’t really very inspiring. Happily there are enough of nice forest trails, too, and the section through the Skuleskogen National Park was gorgeous. If you have time I’d recommend planning a day to just explore the National Park and then hike on. Plan the travel there and back via Resrobot, one of the best travel apps I have used. It helps you to find the best Bus/ Train/ Flight connections from e.g. 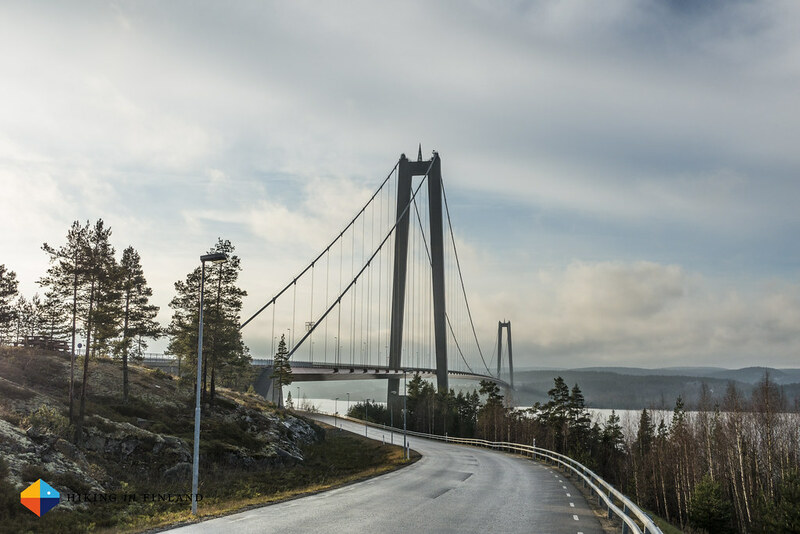 Stockholm to Hornöberget and Örnsköldsvik and also lets you book the tickets right away. 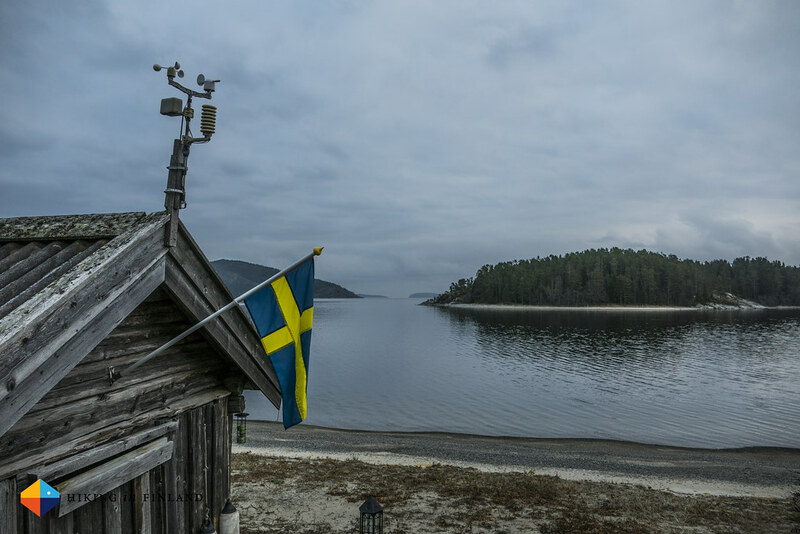 Visit Sweden and the Högakustenleden + High Coast Trail websites offer a host of information about Sweden and the trail, especially the last page has a great overview map and a description of each section. You can order from there also the useful Trail Guide, though don’t bother with the (free) map as it’s too large a scale to be useful for hiking. Speaking of maps, you really can hike it just with the maps in the Trail Guide. 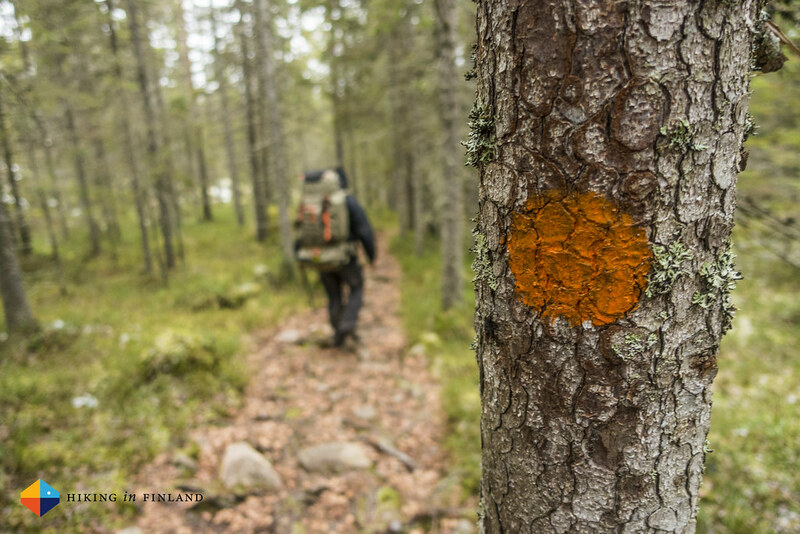 The trail is exceptionally well marked and so very beginner-friendly, sometimes every third tree has an orange dot or stripe. 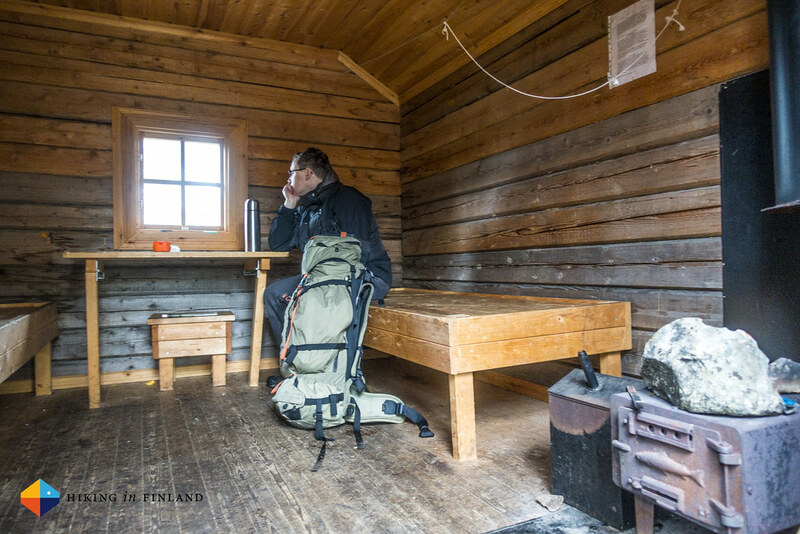 We slept every night in one of the free huts or Laavus and were completely alone on the trail, we once encountered day hikers. But then we were hiking in November, so in the spring, summer and autumn that could look very differently. 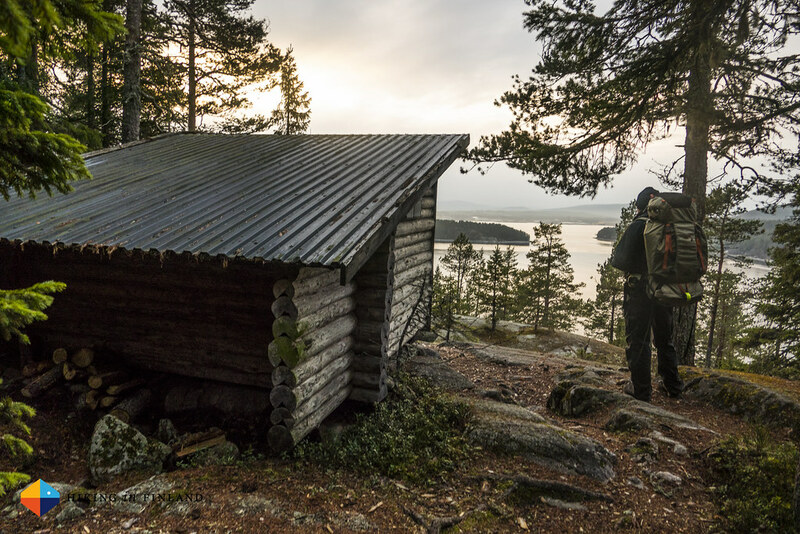 I recommend you take a shelter along when hiking in those months, or make use of the various accommodation options along the trail. 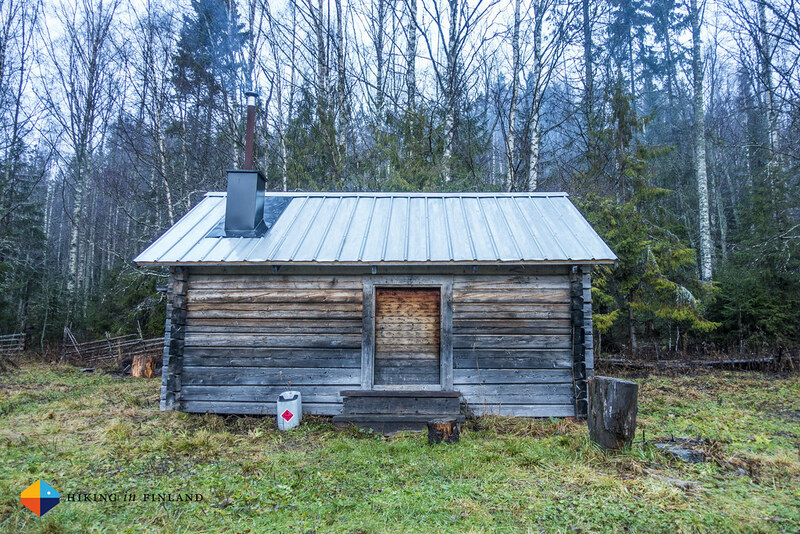 Basic ultralight gear choices would suit the trail well, you can practice pitching tarps and sleeping with a quilt here very well as you could always head to one of the Laavus or Huts. From Ullånger on you almost daily would pass a village with a supermarket, Café and Restaurant, so you could easily resupply along the trail (or buy a Swedish Beer for the evening each day =). 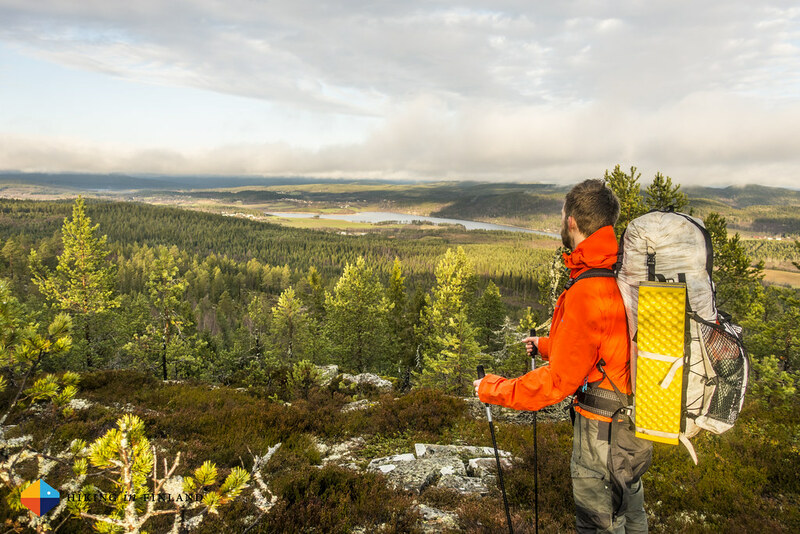 Along the trail you also could easily go packrafting, sea kayaking, climbing and Via Ferrata. While you could do some of these activities just besides the trail you’d need to plan an extra day for some others. 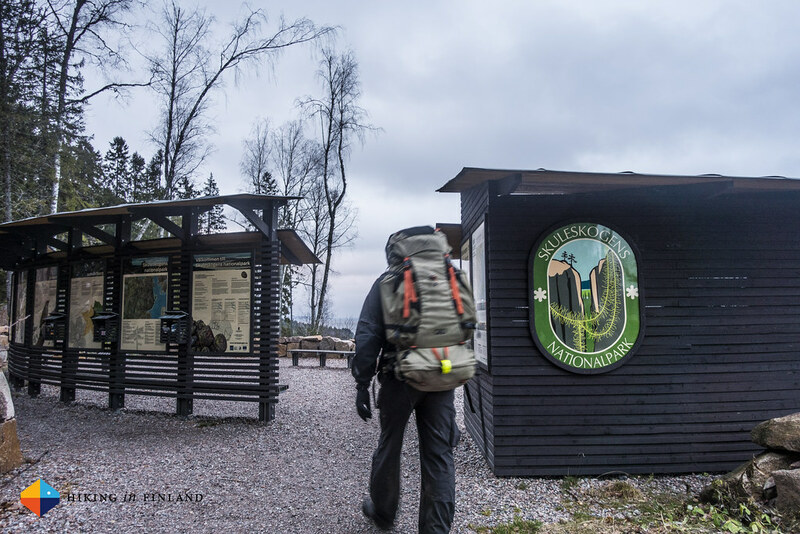 Because of the good infrastructure (huts & Laavus, Restaurants and Shops along the way) the trail could be a good choice for families who want to try backpacking with their kids.